I have kept a dream journal for many decades and I know it is the most important book that I will ever read. I say this as a voracious reader with a personal library of nearly 14,000 books. My journal is my personal encyclopedia of symbols. It is my user's manual for living a fruitful life and choosing wisely between alternate possible futures that my traveling self visits every night. It is my scientific data log for incidents of precognition, telepathy and clairsentience, and for transpersonal experiences in which, for example, two or more people are engaged in the same dream activities. It is my atlas of the multiverse, my magical diary and the core of my personal mythology. It commemorates the nightly screening of gods, archetypes and daimones. It is starter dough for creative expression. It is the first and sometimes the best draft of pages that will appear in my books or be shared as stories in my lectures and classes. It is a book of clues, full of curious words and intriguing details that will send me off on research assignments. Dreaming is not fundamentally about what happens during sleep; it is about waking up to a deeper order of reality. So my journal not only contains reports from sleep dreams, but also from shamanic journeys and special moments of synchronicity when we become vividly aware that ordinary life may be a waking dream. I take particular care to record the impressions that come in the liminal space between sleep and awake. The most important spiritual dialogues of my life have unfolded from contact with inner guides who communicate in this space, and some of my most thrilling adventures in lucid dream travel have taken off from here. My journal reveals continuous lives that I seem to be leading in parallel worlds where I made different life choices. It shows me threads of connection between my present dramas and those of counterpart personalities living in other places and times, and helps me to pull gently on the web, to bind or release. My journal holds up a magic mirror to my attitudes and actions, offering course correction and restoring my inner compass. It helps me to track my progress in the practice of continuity of consciousness. This involves retaining witness perspective and awareness of choice in two or more realities simultaneously, as you cycle through states of sleep, dream, sleep-wake, waking dream and more. 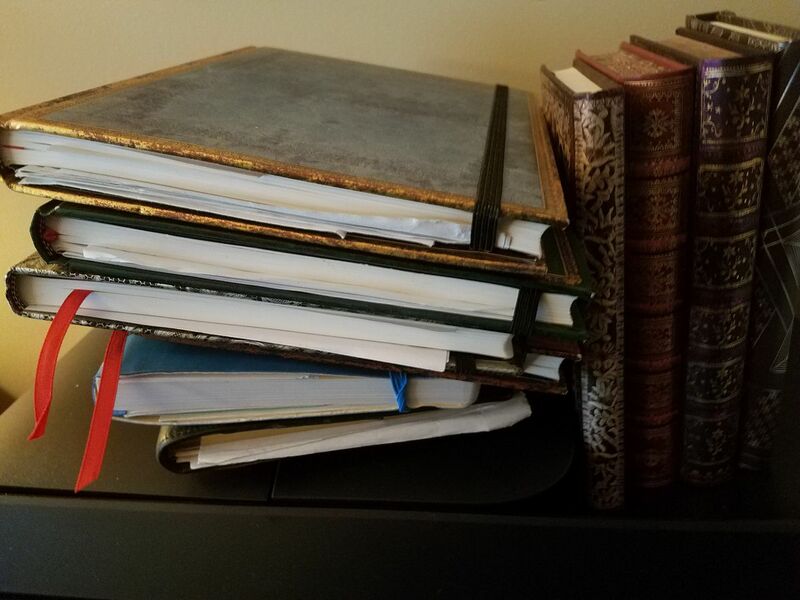 I may write my first reports of the day with a pencil or a fountain pen, in a beautiful bound journal with archival quality paper that invites me to sketch and to color as well. As soon as possible, however, I'll transcribe my reports into a digital data base. I date and title each report, so I have an instant chronological index. Saving my documents in Word gives me a search engine so if I want to track a theme or a name over all the years - "black dog", "Mircea Eliade", "HG" [hypnagogic] - all I have to do is type it in the box and all the relevant entries are there before me. No doubt everything is recorded somewhere - more likely in nonlocal mind than the basement of the personal subconscious - but it is essential (and can be wonderful creative fun) to develop searchable logs of this kind over time. They become the most important scientific data (in the sense of state-specific science, adequate to the field under investigation) in this area that we will ever attain. How much to record? My feelings will guide me on the urgency and importance of a dream - and indeed of whatever enter my field of perception - and how much detail I should include in my journal reports. On most days, I don't try record everything I remember from my dreams, just as I don't write down what I ate for breakfast or how many times my dog relieved himself in the park. A map as big as a country is no longer a map, as in the Borges story. There are limits to how much even the most dedicated dream journal-keeper can bring back from a night in the multiverse. On some days, my inner guidance is to write down whatever I remember as soon as possible, and let further writing and pattern recognition emerge as I do that. This works really well when I start by drawing something from the dream. On other days, my guidance is to forego journaling altogether in favor of simply writing with the energy and elements my dreams and hypnagogic experiences have given me. Some of the things that happen in Dreamland and stay in Dreamland have enduring effects even when we are amnesiac about what happened. I have been being more diligent about writing in my dream journal so far this year and doing so has been very rewarding by offering such a sense of adventure. A couple of nights before going to sleep I have asked for dreams for guidance with certain issues I'm dealing with and although there's been mornings when I can't recall the dreams, I still have felt as though I received guidance which helped to shift my energy and perspective. I find this to be fascinating. I'll be honest, I'm struggling with recording every dream I continue to have which involve my ex-boyfriend because I don't really want to remember all of them. I feel like I'll be too enticed to repeatedly go back and read in my dream journal all the dreams I've had with him and yearn to be back in my relationship even more than I already do. I'm dealing with unrequited love and I keep dreaming about being back in my relationship. I experienced such beautiful and powerful synchronicities in connection with this person which make it hard for me to let go, yet I know it's for the best, at least at this time. I wouldn't be surprised if I have experienced soul loss from going through this break up. I know I have a lot to work on and heal surrounding this and your online course "Dancing with the Bear" is being offered at a time when I greatly need help. I'm grateful for the opportunity to learn more from you, Bear, and other helping spirits.